At the end of every year, most of us look back and think about what changes we might like to make for the next. Which things worked out well, which things didn't. The fishing business is no different, and 2009 was a tough one for me. One change will be this blog. I have a nice website that I try to update, but it's too much of a hassle to do regularly. Hopefully, this blog will be easier to post my reports and photos on. I am increasing my rates for the first time in three years to be more in line with industry standards, but I'm still the best value you will find on the water. 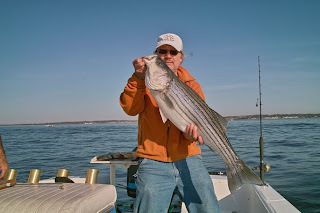 I am offering two options for the 2010 fishing season. The first option is a Standard Charter for two anglers. Standard Charter Trips will last approximately 5 hours and include the high quality service and attention to detail that my clients are accustomed to. Standard Charter trips are $360 and require a deposit of $100. These trips are strictly limited to two anglers. 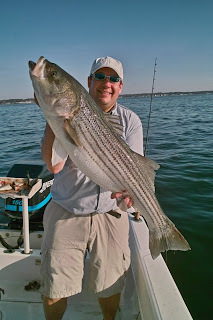 The second option for 2010 is the Fish-Along Trip for single anglers. Here’s the deal – for $150 you get 5 hours of fishing, but it’s not a traditional charter. I supply all the bait, tackle, lures, rods & reels, snacks and drinks, but I’ll be fishing right next to you. The purpose of Fish-Along Trips is to provide an opportunity for anglers who want to experience world-class fishing without going through the trouble of organizing a charter. Before hopping aboard a cut-rate charter operation, ask to see their credentials. I raised my oupv (6-pack) license to a 25-ton Master this year. While I don't carry my USCG credentials in my wallet, I do carry the NYSDEC Marine Party / Charterboat license as required by law. If you're on any boat out of NY, ask to see it. If they don't have it, they are violating the terms of their insurance policy and are not covered if you get hurt on their vessel. I carry $1,000,000 commercial boatman's liability insurance to protect myself and my passengers. Do it the right way, and fish with a pro. Why fish with me? Simple - I will work harder to put you on fish than anyone you have been out with. I will stop at nothing (within the boundaries of safe operation) to put fish on your line. Top-shelf equipment, a fast boat, great knowledge of the water, live bait whenever possible and a great network of fellow guides. When not spend your time fishing by giving yourself the best shot at catching the fish of a lifetime?